In the front on the left are two spinach and sun-dried tomato frittatas, based on Isa's swiss chard frittata from Vegan Brunch. 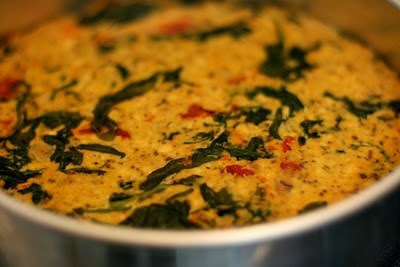 I had two bags of baby spinach I had intended to use in an Indian dish this week but never got around to making. I figured sun-dried tomatoes would make the perfect accompaniment (they did). I was a little worried about the whole thing holding together so I added 2 tbsp of chickpea flour. The end result was amazing: nice and tender and bursting with flavour. I scaled back on the soy and seasoned with black salt to get a nice eggy flavour. 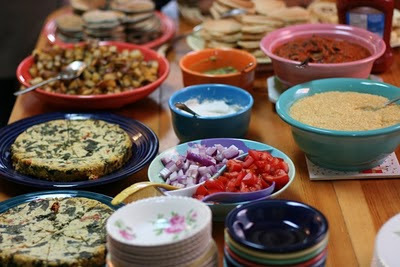 On the front right is polenta rancheros, also from Vegan Brunch. What you are looking at is a bowl of soft polenta, a bowl of black beans in rancheros sauce, and a variety of fixins (red onion, tomato, cashew sour cream, guacamole). This is a fantastic dish. You start with some beans, add a dollop of polenta, then garnish. This one is going into my brunch rotation. 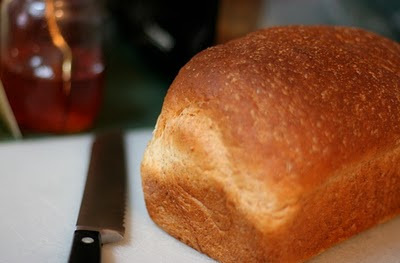 I also made some whole wheat bread for toast. 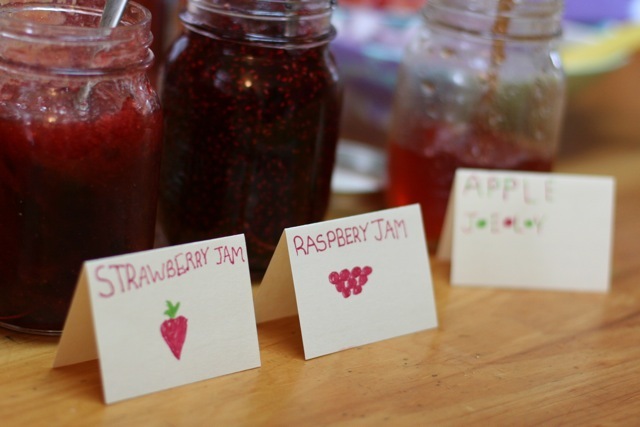 Son#1 made these signs for all the homemade jams and jellies. In addition to cinnamon buns, I made these thumbprint rolls from Reinhart's Artisan Breads for Everyday. 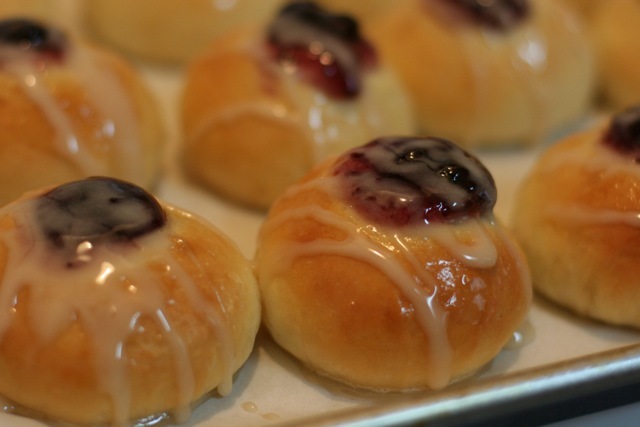 These are a sweet roll filled with fruit and glazed with icing, and they disappeared pretty quickly. I put the fruit filling in a piping bag and I found that to be an effective way to get maximum filling in without making a huge mess. The guests brought muffins, fruit salad and trays, juices, and coffee and tea.